The historic Apollo 11 mission unfolds with a nation watching, but Flynn arrives near mission control and sets out to rewrite the events of that day, and the trio reach out to an unsung hero to thwart Flynn's scheme. Isn't interacting with your parents the surest way for a time traveler to erase themselves from the timeline? If Gabriel was born before Flynn, then surely his death shaped the course of her life which led to meeting Flynn's father. It also seemed like a stretch to believe that Johnson would get recognized as the hero rather than somehow get scapegoated. Though maybe Rittenhouse got involved in the cover-up what with how Rufus and Andrew were throwing the name around in front of everyone. Well, at least this is a good reminder to make sure to see Hidden Figures in the theaters. As we've discussed here in the past, this show seems to hold to the theory time travel that says you can't go back to a time (or alter a time) in which you existed. Well surely Anthony is old enough to have been alive during the time of the first lunar landing. Other than that, they telegraphed Flynn's mother pretty hard. I really would have liked to have been surprised (like maybe it was his mother-in-law for example). I thought Wyatt should have been the one to talk to Rufus. He'd be in a better position to talk about post-killing reactions. 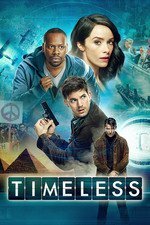 As we've discussed here in the past, this show seems to hold to the theory time travel that says you can't go back to a time (or alter a time) in which you existed. I thought they were going by the 'no do-overs' time travel rule, that they can't go back and try to fix the Hindenburg or anything where they'd cross paths with themselves/the capsule, not that they have to avoid all years since their birth. Well surely Anthony is old enough to have been alive during the time of the first lunar landing. For what it's worth, Matt Frewer (who plays Anthony) was 11 in July 1969. Matt Frewer is younger than I am? Now I'm really depressed. Oh thank god. That date 1958 makes way more sense to me and to my sense of who the actor is. I was starting to doubt my own recollection of his work and his roles (especially as related to my age at the time). Oh, oops, now I see I misread ricochet biscuit's comment as saying he was born in 69 rather than him having been 11 in 69. Sorry for the panic derail. I misread it the same way you did. Something about the date must just automatically short-circuit the brain into "birth date" mode. Max Headroom? My mind is b-b-b-b-blown! I'm glad they didn't go with Johnson becoming the scapegoat. Maybe fixing that in the show's timeline is a way of fixing it in our real one. I can't help but wonder about the people that get killed in each episode. That's a lot more significant than crushing a butterfly. It seems a little careless. Oh, I had such a crush on Matt Frewer as Edison Carter in the Max Headroom US tv series. No matter how many creepy villains Frewer plays, I will always have a soft spot in my heart for them because of that first impression. OMG, and he's Dr. Leekie, too. I'd forgotten! Just to be detail obsessive (and gosh it seriously dates me) but Rufus puts the tape back on the reel hub backwards. The write protect ring is clearly visible, it goes on the inside. They did get the impatient pause while the vacuum initialization startup happens, too bad they didn't have a working tape unit, the cycle where it prepares the tape is visually quite fun. To keep the tape steady it had a vacuum column on each side of the tape head. Okay, if we're going to get picky about details, if Rufus had never worked on those systems, what are the odds he knows the programming language well enough (at all) to be able to implement a fix to the virus? Did anybody else notice the color bars and NO SIGNAL messages on the Mission Control monitors while the comms were down? There were no color monitors in Mission Control and the computers would not have stopped working like that, and if the actual displays had lost signal they would not have had the electronics in them to display NO SIGNAL like a modern TV set does. The way inch-wide paper tape was used also doesn't seem authentic. My father had both a high speed optical reader and a model 33 teletype with an electromechanical pin style reader in his lab in 1974, and both were loaded by releasing a clamp, placing the tape flat on the read surface, then closing the clamp over the tape. That said, the actual story was one of the more fun and interesting ones and the tie-in with Hidden Figures made me smile. While it was the write protect ring that got me, the general look of the data center wast pretty clean and visually looked right, so much was wrong, NO network, No viruses. No color, no loud cachunk cachunk of a huge printer. NO passwords there was no real operating system -- a program just loaded direct into hardware and ran, really doubt a swipe-able photo badge. Katherine Johnson WAS the computer. Remember if you're reading this on your phone, you're holding more compute power than in all of NASA at the time, it's amazing what can be computed by hand. So really great kudos to the writers to try a timetravel plot slightly more subtle than, jump back and kill the grandfather, but wow, history is hard, and science/tech history is really hard. FTFY. Actually it was pretty close, all the computing power in the world in 1969 was actually close enough to the power of one late model iPhone that you can quibble a bit about it. But go five years back the iPhone clearly wins, five years forward you need a few iPhones to power the world. Have another speculation on that.